Terminal. App with diverse functionality, but most importantly, create shortcuts. File Explorer. 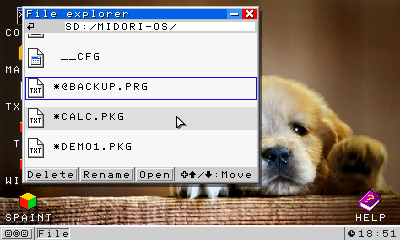 App to rename and delete files from SmileBASIC. Wire3D. A small 3D demo, showing an hypercube. Input test. 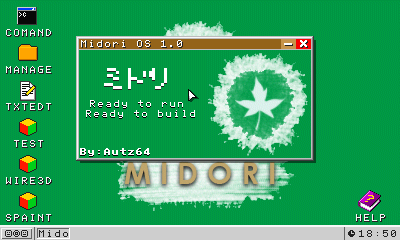 Another small demo, showing different functionalities of Midori API. Help. An useful embed app that tells most details of Midori usage and app development. 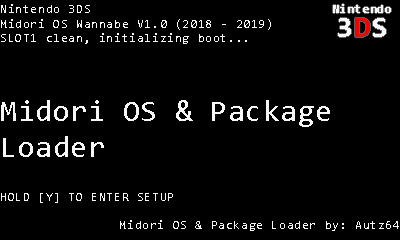 DEMO2 (as external .pkg). Small app that abuses direct memory access to corrupt programs. Spaceship (as external .pkg). Small minigame where you shoot aliens. Calculator (as external .pkg). Simple Calculator. Instructions Load "EXECUTE" file, and let it do some magic. All programs are acessible via Start Menu -> Programs. R while hovering a box on taskbar: Close that window. For app development, refer to the following pages: API reference: https://smilebasicsource.com/page?pid=1211 Making your first app: https://smilebasicsource.com/page?pid=1212 Notes Why is "Midori" written in Katakana? Check out the API DEF reference to see changes! MochaProbably Expert Programmer Programming no longer gives me any trouble. Come to me for help, if you like! Programming Strength Night Person I like the quiet night and sleep late. Express Yourself Drawing I like to draw! Hobbies 2 months ago woah something that has caused me to retrieve my 3ds from the 4th dimentional void and download a project again! 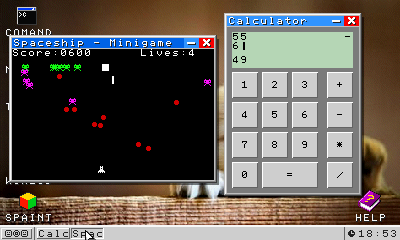 RGamesOffical Intermediate Programmer I can make programs, but I still have trouble here and there. Programming Strength Minecraft Is Awesome! I love Minecraft! Express Yourself Video Games I like to play video games! Hobbies 7 months ago Yeah... this is not the place to rage quit... 12Me21 Syntax Highlighter Received for creating the code syntax highlighter on SBS Night Person I like the quiet night and sleep late. Express Yourself 7 months ago You should definitely use GCLIP if you aren't already. 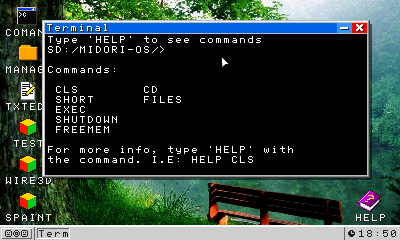 CyberYoshi64 Intermediate Programmer I can make programs, but I still have trouble here and there. Programming Strength Night Person I like the quiet night and sleep late. Express Yourself 3 months ago Yeah, if a graphic in an app would go beyond the window, it can so and dance around outside of the window This happened to me by doing this: - Open the DEMO1 app and spawn a child. - Close the dad and open the Spaceship game. - Mash the L button on the "Send message to dad" text on the child and the game starts for 1 frame and then returns to the title screen though it didn't reset the variables. - After 1 hour of mashing L I managed to get -100 lifes which doesn't fit in the window so it goes beyond it. Autz64 QSP Contest 1 Winner I won the first SmileBASIC Source QSP Contest! Programming Contest End of 2017 Contest Participant I participated in the SmileBASIC Source End of 2017 Contest! Programming Contest Deep Sleep Hidden Website 3 months ago The way how DEMO1 works is with direct memory manipulation. That's expected, but I should do some checks to avoid it. LucasJG1994 7 months ago I'm truly amazed at what people can do with SmileBasic. Great job in making this. I'd like to make a request to the website and to those who are very experienced in programming that if it would be possible to make an emulation which is focused around the Assembly Language. This means that you have the means to mess with memory that controls not only the hardware but also the buttons and touch screen, etc. I've been experimenting on the old commodore 64 and Ti-99/4a emulators to see how Assembly Language can be used to create programs that pus the limits of the machine. (Even though it's an emulator) bluekrill Intermediate Programmer I can make programs, but I still have trouble here and there. Programming Strength Drawing I like to draw! Hobbies Video Games I like to play video games! Hobbies Edited 7 months ago I'd be happy to help with an emulator! 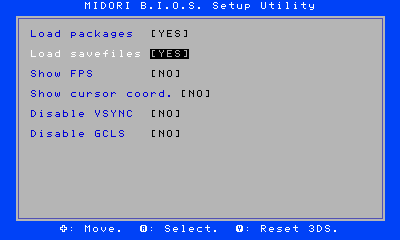 I've designed two virtual 16-bit computers which run in SmileBASIC that are programmed in a unique assembly language. I love the low-level stuff! LucasJG1994 7 months ago @bluekrill Thanks for the help. I also am fascinated by the old languages such as assembly. But i also find it important to learn this language as it opens you eyes to what you can really do with a machine without restrictions. bluekrill Intermediate Programmer I can make programs, but I still have trouble here and there. Programming Strength Drawing I like to draw! Hobbies Video Games I like to play video games! Hobbies Edited 7 months ago I've written a few programs for my virtual computers. My favourites are probably my brainfuck interpreters because they are very easy to write in assembly! :) 12Me21 Syntax Highlighter Received for creating the code syntax highlighter on SBS Night Person I like the quiet night and sleep late. Express Yourself 7 months ago (I'm using my old 3DS right now, so this might not actually be a problem...) I think it would be better to use the entire lower screen to control the mouse, maybe holding L or something would switch between keyboard and touchpad mode. Also there seems to be a problem with dragging windows around while using the touchscreen to control the cursor. Autz64 QSP Contest 1 Winner I won the first SmileBASIC Source QSP Contest! Programming Contest End of 2017 Contest Participant I participated in the SmileBASIC Source End of 2017 Contest! Programming Contest Deep Sleep Hidden Website Edited 7 months ago I have an old 3DS (small) and is not a problem for me because I got used to it. I could add that feature. 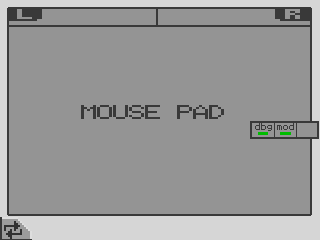 And yes, the cursor goes "off" when dragging near the window borders (specially up and down). I have an idea on how to fix it but, uhm... it gives these errors. Good thing the stick movement is not THAT noticeable. snail_ QSP Contest 1 Contest Participant I participated in the first SmileBASIC Source QSP Contest! Helper Received for being very helpful around SmileBASIC Source Achievements Amazing Contributor Someone thinks I'm an awesome person who has done so much for the community! Achievements 7 months ago If you held L to enable the keyboard, you couldn't have a shift shortcut (unless you mapped it to another button.) IAmRalsei Forum Leader Hidden Achievements First Year My account is over 1 year old Website Expert Programmer Programming no longer gives me any trouble. Come to me for help, if you like! Programming Strength Edited 7 months ago You could just have briefly pressing L be a quick shift button.